* This election season we’ve talked a lot about Latinos and African Americans. Asian Americans – while still less that 10% of the U.S. population – are the fastest growing demographic group in the country. In fact, since 2012, there’s been a 12 point increase in the percent of Asian-Americans who identify as Democrat — from 35 percent to 47 percent. Asian-Americans overwhelmingly supported Barack Obama in 2012 — 73 percent to 26 percent — so these latest poll numbers suggest a crystallization of party ID among people who perhaps already lean Democrat. But, the partisan divides are growing and particularly obvious among young Asians, who now view the Democratic party far more favorably than the Republican party (77 percent compared to 12 percent). * For all those who predicted that the Iran nuclear deal would be a disaster, this kind of news must be extremely discouraging. Iran held to its accord with world powers by keeping the amount of nuclear material it produces below agreed thresholds and continuing to allow monitors wide access to facilities, the International Atomic Energy Agency reported on Friday. “The agency continues to verify the non-diversion of declared nuclear material at the nuclear facilities and locations outside facilities where nuclear material is customarily used,” the IAEA wrote in a 5-page restricted report distributed to member governments and obtained by Bloomberg News. Iran has additionally taken steps required to allow more inspectors into the country, according to the IAEA. * Dahlia Lithwick has some advice for liberals on how to improve the discourse. I’m not a psychologist and can’t speak to the outrage. But I think a lot about how we speak to one another, and I worry that my progressive friends and I are falling victim to some habits and ideas that have made it virtually impossible for the left and right to even engage—much less debate—serious issues anymore in this country. I see them in myself in alarming new ways when I find myself digging in on Bernie vs. Hillary. I wonder if now is the time to talk about it out loud. I encourage you to go read her list of the 4 things we need to stop doing. * Sometimes the most powerful messages don’t come from campaigns – but from everyday citizens who have something important to say. The President is an Asiaphile. He spoke wistfully of his time in Indonesia and his memories of the smells and flavors of street food there. He clearly enjoyed sitting on a low plastic stool eating bun Cha. It felt to me like his night off. Even with Secret Service lurking nearby. He was among the very few guests on my show who ever asked the camera crew if they got to eat too. And he made a point of taking a picture with all of them when we were done. * Finally, as we saw earlier today, President Obama talked about a “moral revolution” during his remarks in Hiroshima. 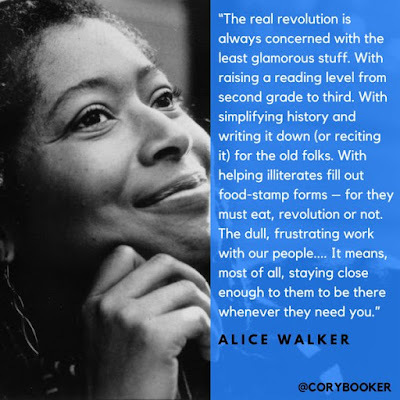 Alice Walker speaks to the particulars of what revolutions actually look like.